Although we have finished our organization series, I wanted to give you some bonus material just for fun! If you need to catch up, start here with how Being Organized Can Save You Time and Money. and Clutter Overload Part 1. Earlier in our marriage, my spice shelf was out of control. Probably because I had so many different types of spices, and sometimes duplicates of spices, that we had received as wedding gifts. The result was a jumbled mess that didn't make sense, and I always ended up pulling out the entire contents as I searched for that one specific ingredient before dinner. Sometimes, I'd find out that I didn't even have that ingredient at all! That made me even more frustrated. So, I decided a spice inventory list was in order. If you don't have a ton of spices, you can easily type up what you have on a Word document, print, and post on the inside of your cupboard where you store your spices. If you have quite a few spices like I do, you can download this beauty and check off what you have, or add a few oddballs that might not be listed. 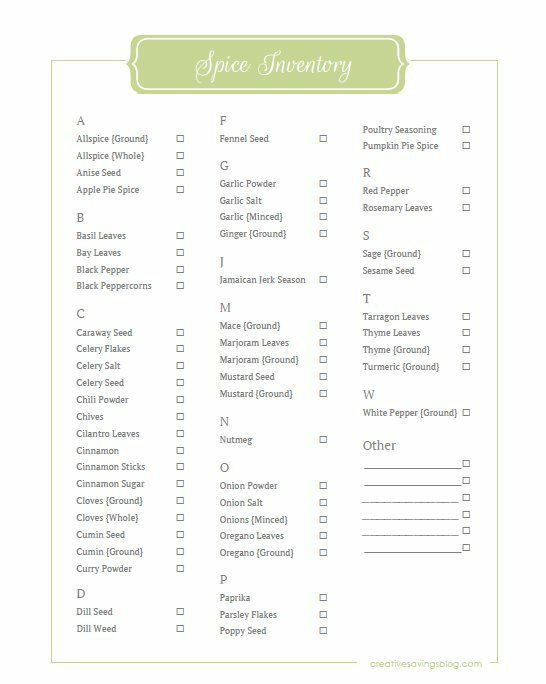 You can download the Spice Inventory Printable here, or click on the graphic to print. This makes life in the kitchen so much easier! Enjoy! What is your favorite spice to use?